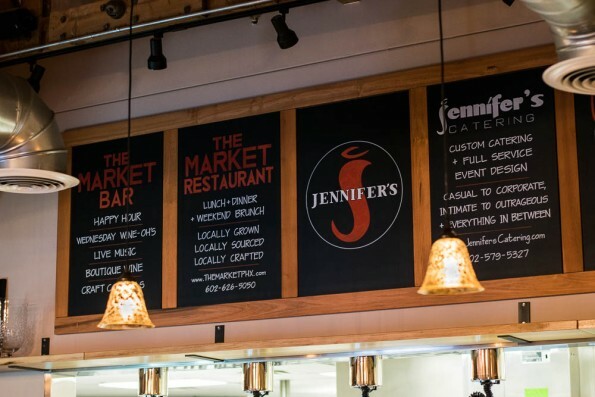 Spring has come to The Market by Jennifer’s Restaurant and Bar! Operated by Jennifer Russo who relocated her catering operation of 19 years, to Gaslight Square on 36th Street and Indian School Road back in 2013, Jennifer quickly realized while building her catering business would not be enough and in 2014, The Market by Jennifer’s Restaurant and Bar was opened. With the help and guidance of long time friend Richard Fiero (previously of Barrio Cafe), Jennifer and Richard developed a dining experience “that is both casual and elegant with a menu that incorporates locally grown, sourced, and crafted ingredients.” Recently, we were given the opportunity to try out the new menu and let’s just say, we couldn’t be happier for Spring! Are you bored with typical restaurant charcuterie? Personally, we never get tired of gorgeous charcuterie boards. However, if you are looking for a beautiful, tasty and mostly locally sourced charcuterie board, The Market by Jennifer’s Restaurant and Bar is the place to go. 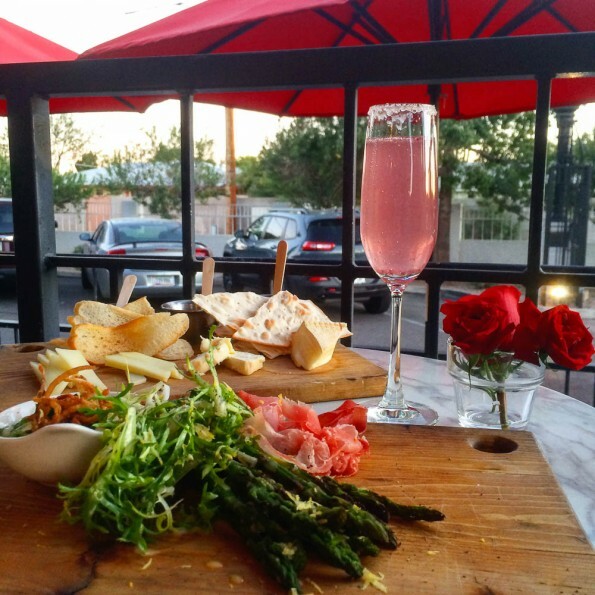 We tried their Cheese + Charcuterie and Asparagus Boards. The Cheese + Charcuterie Board features cheeses from local cheese monger Lara Mulchay (co-owner of Arcadia Premium), fruit compote, Nutsack almonds, AZ honey, violet mustard, shallots, and garlic aioli. The selection of cheeses was fantastic and the addition of caper berries served with the charcuterie was excellent! We also really enjoyed the flavor and texture of the violet mustard. The Asparagus Board was a unique change of pace to your typical cheese board. It was comprised of grilled asparagus, burrata (one of our new favorite cheeses thanks to Central Bistro), prosciutto, frisee, leeks, and Go Lb. Salt South Pacific. While everything this board was fantastic, the frisee was extremely well dressed and packed full of flavor. In addition to the boards we tried, we were also served some appetizers being offered this Spring. Our favorite was the Carpaccio. 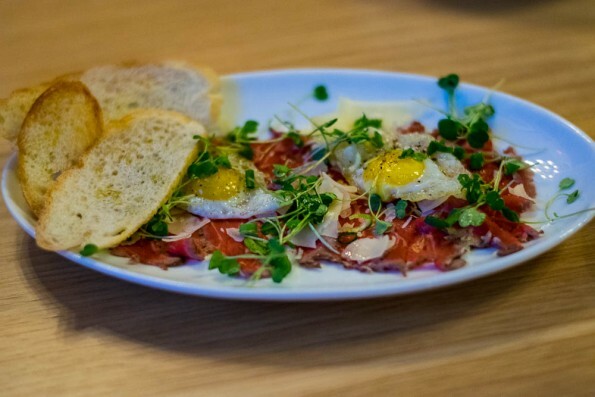 Their carpaccio consists of tenderloin, pecorino, quail egg, citrus oil, micro arugula, and Go Lb. Salt Truffle Salt. We so rarely see beef carpaccio on menus in the Valley that it was a nice treat. The addition of Go. Lb. Salt Truffle Salt is what really sets this appetizer apart and gives it blast of umami flavor. If you haven’t had a chance to try it yet, go pick some up (you can pick some up in the market at Market by Jennifer)! Following the rest of the appetizers and a salad course, we arrived at the entree course (how we had room to eat is a feat in itself). Every major group was covered: pasta (gnocchi specifically), seafood, chicken, pork, and beef. All were divine and executed perfectly. Of course, however, we did have our favorites and it was a toss up between the Gnocchi and Salmon. The Gnocchi which is a house ricotta gnocchi with roasted pork, wild mushrooms, spinach, basil, and tomato vodka coulis is prepared perfectly. The gnocchi was just right, not mushy or too dense and the flavor was rich and not too acidic. Salmon is always a popular choice on restaurant menus. 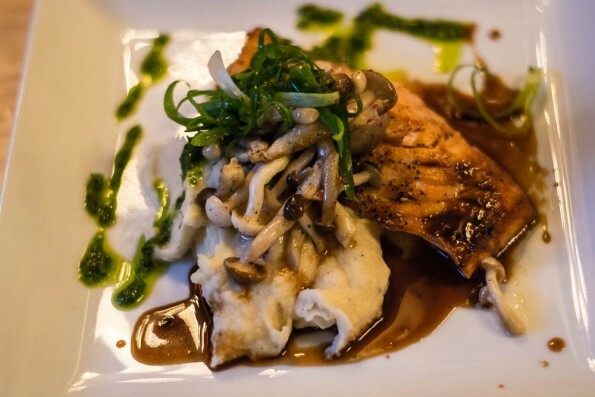 The Market doesn’t play it too safe however and delivers a seared salmon with bunashimeji mushrooms, parsnip puree (a great substitute for mashed potatoes), pinot noir reduction, and gremolata. There is a richness about this dish that is an uncommon but welcome change from what one might expect from a seafood dish. The pinot noir reduction and parsnip puree are the perfect pairing for this expertly cooked salmon. Last but certainly not least was dessert. We had a variety to select from: Deconstructed Strawberry Shortcake, Callebaut White Chocolate Mousse, and Flourless Chocolate Cake. Hands down we both adored the Flourless Chocolate Cake. 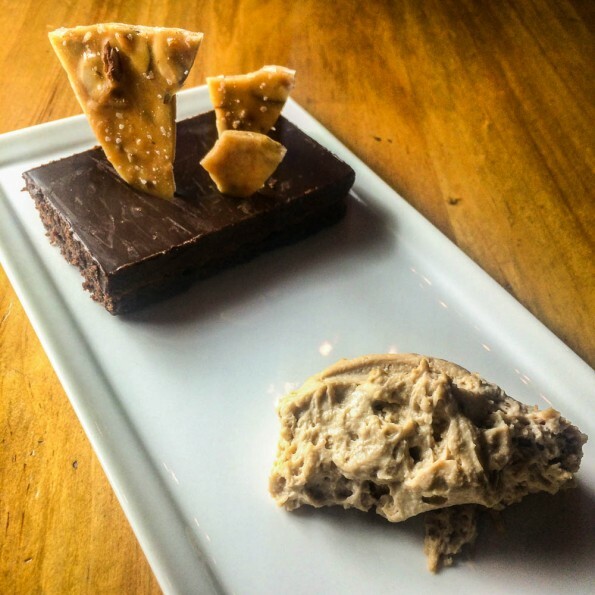 Not only is it served with cake but also an espresso mascarpone and almond brittle. This dessert is a decadent delight! The most impressive feature of the dessert is the espresso mascarpone which has a wonderful espresso flavor and light texture. The Spring menu at Market by Jennifer’s Restaurant and Bar is exactly what you’d expect from a Spring menu. It is full of light yet rich flavors and the use of local produce and food items really connects diners to Phoenix food culture in a meaningful way. What is also great is that not only is it a fantastic spot for dinner or lunch but with their large selection of boards and small bites its a good spot for happy hour! *The Geeks participated in a media dinner in order to facilitate this write-up; However, opinions are wholly our own. View our Disclosure Policy for more info.